As I work to complete my first 100 "MOC points" suddenly due 12/31/2018, I think my readers should be aware of the deceptive trade practices that have impacted me since I paid for the American Board of Internal Medicine's (ABIM) Maintenance of Certification® (MOC®) program in 2013. 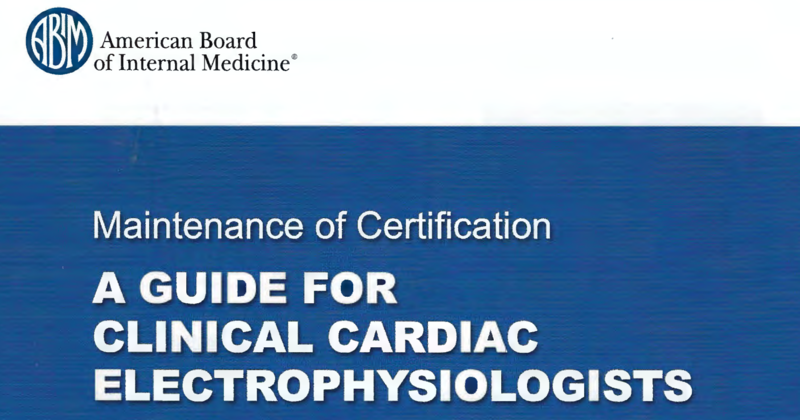 First of all, after realizing my Board certification in Cardiovascular Diseases would expire in 2013, I paid for my Maintenance of Certification product to qualify to take my recertification examination in Cardiovascular Disease the Fall of 2013. At that time, I was subject to the ABIM's "double jeopardy" situation - if I did not pass my Cardiovascular Diseases re-certification, when it came time to re-certify in Cardiac Electrophysiology, it too would expire since the Cardiovascular Disease requirement was a pre-requisite for sitting for my Cardiac Electrophysiology re-certification examination. (This "double jeopardy" requirement was removed in 2015). After paying for the ABIM MOC® product, this flier was sent to me explaining "Maintenance of Certification at a Glance." On page 2 of the above flier, we can clearly see that I purchased the ABIM MOC® product that required only "100 points of Self-Evaluation of Medical Knowledge and Self-Evaluation of Practice Performance credit" to be in good standing with the ABIM for 10 years. After completing the secure examination in the Fall of 2013, I received this letter on 22 January 2014 notifying me that I had passed the Cardiovascular Disease examination. It stated by Board certification "will remain valid until 2023." Also on that letter, I was told that "requirements to maintain certification will be changing in 2014." Little did I know that after 2014 they would require twice as many MOC points (100 "points" every five years) to keep my time-limited ABIM board certification in good standing. I did not agree to this change when I purchased my MOC® product from ABIM. As a result, I have now spent an additional $1675 purchasing continuing education modules from the American College of Cardiology to meet this new requirement. While I am not an attorney, I believe changing these rules for the MOC® product that I had already purchased in 2013 from ABIM represents deceptive trade practices and will not rest until the ABMS MOC® product and its requirement for continuous certification (with its continuous payments to the ABMS member boards and their supporters) comes to an end. "I agree to indemnify, release, and hold harmless ABIM, its employees, officers, directors, members, agents, and those furnishing information about me to ABIM from any claims, liability, or damage by reason of any of their acts or omissions, done in good faith, in connection with: this application; information furnished to or by ABIM; the evaluation of my qualifications; ABIM examinations; the enforcement of ABIM's Policies and Procedures for Certification, and the policies for recertification outlined on ABIM's website, as well as all terms, conditions, and rules set forth in this website, as they may be amended from time to time; and any other action taken with respect to any certification or recertification granted by ABIM. I understand that all ABIM materials are protected by the federal Copyright Act, 17 U.S.C. § 101, et seq. I further understand that ABIM examinations are trade secrets and are the property of ABIM. Access to all such materials, as further detailed below, is strictly conditioned upon agreement to abide by ABIM's rights under the Copyright Act and to maintain examination confidentiality. I understand that ABIM examinations are confidential, in addition to being protected by federal copyright and trade secret laws. I agree that I will not copy, reproduce, adapt, disclose, solicit, use, review, consult or transmit ABIM examinations, in whole or in part, before or after taking my examination, by any means now known or hereafter invented. I further agree that I will not reconstruct examination content from memory, by dictation, or by any other means or otherwise discuss examination content with others. I further acknowledge that disclosure or any other use of ABIM examination content constitutes professional misconduct and may expose me to criminal as well as civil liability, and may also result in ABIM's imposition of penalties against me, including but not limited to, invalidation of examination results, exclusion from future examinations, suspension, revocation of certification, and other sanctions." "2. This case is also about ABIM’s illegal creation and maintenance of its monopoly power in the market for maintenance of certification. ABIM is the monopoly supplier of initial certifications for internists. Beginning in or about 1990, ABIM used its monopoly position to create a second monopoly in the maintenance of certifications for internists. Since then ABIM has used various anti-competitive, exclusionary, and unlawful actions to promote MOC and prevent and limit the growth of competition from new providers of maintenance of certification for internists. ABIM’s conduct, including but not limited to tying and exclusive dealing, has harmed competition by preventing competition from others providing cheaper, less burdensome, and more innovative forms of maintenance of certification desired by internists. 3. The tying product is ABIM’s initial board certification, which it sells to internists nationwide. ABIM sells initial certification services to physicians in internal medicine and twenty foundational subspecialties within the field of internal medicine. Many internists hold multiple ABIM certifications, purchasing initial certifications in both internal medicine and one or more additional subspecialties. 4. The tied product is MOC, ABIM’s maintenance of certification. ABIM has tied MOC to its initial certification. As described more fully below, to drive sales of MOC and to monopolize the market for maintenance of certification, ABIM has forced physicians to purchase MOC, charged inflated monopoly prices for MOC, and thwarted competition in the market for maintenance of certification. 5. Approximately one of every four physicians in the United States (including those practicing in fields other than internal medicine), or about 200,000 internists, have purchased initial ABIM certifications. ABIM has throughout the relevant period controlled approximately 100% of the market for initial certification of internists in the United States. Through its MOC program, ABIM has also controlled in excess of 95% of the market for maintenance of certification of internists. ABIM has unlawfully obtained and maintained its monopoly power in the market for maintenance of certification services for the anti-competitive purpose of requiring internists to purchase MOC and not deal with competing providers of maintenance of certification services. 6. Plaintiffs bring this Class Action to recover damages and injunctive and other equitable relief on behalf of all internists required by ABIM to purchase MOC to maintain their initial ABIM certifications." To suggest, even for a moment, that the ABMS's Vision Commission's Draft Report is fully transparent regarding the financial, corporate, and political conflicts that have embroiled MOC® from its inception, working physicians should understand that the "Vision Commission" is little more than a puppet for corporate interests. All the "public comment" in the world - especially when the draft is un-editable and proposes no action to end MOC® - makes a mockery (pun intended) of the entire "ABMS Vision Commission" process. The ABIM employs a medical director with close ties to Price Waterhouse Cooper (PwC), a fact not disclosed on his ABIM employment announcement in 2015. PwC is a network of firms in 158 countries, 721 locations, with 250,930 people that earned $37.7 billion in 2017 alone. I believe PwC is working with ABMS to salvage MOC® - however it is ultimately branded. Why else would so many non-physicians with ties to insurance companies and other interests sit on the Commission, too? Even worse, we now see that the entire Draft Report is based on the same propaganda and "professionalism" definition that led to the MOC® controversy in the first place four years ago. Given these realities, it becomes crystal clear that the Vision Commission's Draft Report is little more than 96-pages of unprofessional deception that is not working to end "continuous certification," but rather perpetuate it. What, then, do the public's comments to the ABMS Vision Commission's Draft Report mean? P.S. For those who still feel inclined to comment on the ABMS Vision Commission's Draft Report, please read the National Board of Physician and Surgeon's critique of the draft report that recommends "an immediate moratorium on several harmful components of MOC." Personally, given the deceptive history of MOC® and the harms caused to physicians and their patients, I see no redeeming qualities to MOC® (or any other forms of "continuous certification" proposed by the ABMS and their member boards) whatsoever and believe the entire process should end immediately for the sake of our profession and our patients. The American Board of Medical Specialties/American Board of Internal Medicine (ABMS/ABIM) Maintenance of Certification® (MOC) controversy continued unaffected in 2018 despite significant pushback from working physicians. For those unfamiliar with this controversy, ABMS board certification of a US physicians was once a completely voluntary lifetime accolade physicians could elect to hold after they completed their residency. They paid to take a test created by a self-appointed "board" of academic physicians in their specialty - analogous to the legal bar examination - that "certified" they had a fund of knowledge acceptable to practice their trade. Physicians used this "board certification" as a marketing accolade with their peers to garner referrals from colleagues. Prior to 1990, ABMS board certification was never required to practice medicine in any US state or territory. Rather, it was the responsibility of the accredited residency program to train doctors and document they had sufficient experience to enter the workforce as that specialist safely. State licensing agencies verified that training and stipulated that physicians earn "Continuing Medical Education" credits to remain current in their field to maintain their state licensure in good standing. In the 1960's, seeing the financial struggles of older boards formed 30 years before that created the lifetime board certification accolade, the American Board of Family Medicine, a new ABMS member board, was created with a new financial model that proved to be very lucrative: time-limited certification. The ABFM would soon be rolling in cash, earning tens of millions of certification and re-certification fees annually. Not surprisingly, it was not long before all 24 ABMS member boards shifted their certification models to implement time-limited certification by 1990, arguing that doctors had an obligation to keep up in their field (and pay the boards recurrent fees to do so). By 2015, the physician board certification and recertification industry mushroom into a $5.7 billion a year bonanza for the academic elite and their industry colleagues with publishing priority in influential specialty medical journals while not disclosing their conflicts of interest. The pushback began in 2012 when one physician became frustrated with the arduous and needless re-certification process. After even more new requirements to time-limited certification were added in 2014, a full-blown civil war in medicine between the bureaucratic elite and working physicians began. It was December 2014 when the full extent of the controversy became apparent: "medical professionalism" defined by luxury condominiums complete with their chauffeur-driven Mercedes S-class town cars, spousal travel fees, high salaries, and undisclosed conflicts of the leadership of the member boards. Never once in the history of time-limited certification were the potential harms of time-limited certification to working physicians considered or acknowledged. Caught with their hands in working physicians' financial cookie jar, the ABIM issued an unprecedented mea culpa message in February 2015 to its physician membership, but instead of coming clean, the cover-up and tap dancing began in an attempt to preserve the money flow. 12 Jan 2018: Practicing Physicians of America (PPA) sponsors a national survey (questions asked here) of physician attitudes about maintenance of certification, including evaluating potential harms to physicians caused by the process. 27 Jan 2018: Psychology of MOC and the Gaslighting of America's Physicians discussed. 2 February 2018: The ABMS tries to quell physician unrest and forms a 'Vision Initiative' with medical specialty societies and state medical societies (among others) concerning MOC. 8 February 2018: The ABMS Vision Initiative Committee is announced and is laced with numerous non-physicians with many conflicts of interest. 15 Feb 2018: The self-selected ABMS Vision Initiative Committee launches their own survey of physician attitudes toward Maintenance of Certification but steers clear of assessing negative consequences of MOC on physicians. 6 April 2018: ABIM publishes its "how-to" video on the Knowledge Check-in program revealing its mechanics. 23 May 2018: After ABIM publishes its tax forms late, PPA announces GoFundMe crowdfunding effort effort to raise funds for a pre-litigation investigation into the ABIM and the ABIM Foundation's activities. 11 Jun 2018: Results of the PPA survey on MOC announced at the AMA House of Delegates meeting in Chicago. 28 June 2018: A critical review of the ABIM Knowledge Check-in option for Maintenance of Certification (video) is published questioning a physician's right to privacy. 2 Aug 2018: The Federation of State Licensing Boards tries to legislate away their liability. 26 Aug 2018: The ABMS releases the results of their survey on MOC and the results are similar to the survey sponsored by Practicing Physicians of America. 6 Sep 2018: A video reviewing the main PPA survey results on MOC from 7007 physicians is published. 7 Sep 2018: PPA's GoFundMe effort reaches its goal of $150,000. 14 Sep 2018: DOJ issues opinion on MOC, calling the program "anti-competitive." 25 Sep 2018: The ABMS and American Board of Urology offer their spin on the DOJ letter concerning MOC®. 1 Dec 2018: The ABIM Knowledge Check-In program crashes and hundreds of physicians are left in limbo. 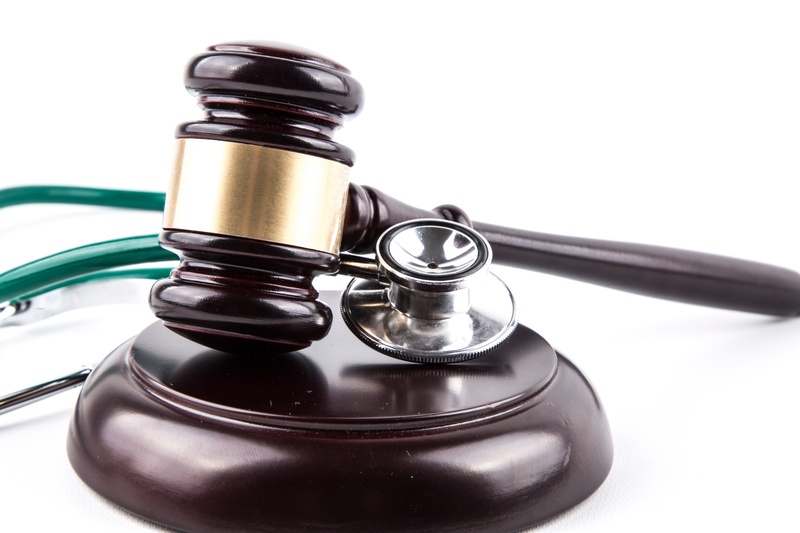 6 December 2018: Four physicians sue the ABIM in a class action lawsuit representing over 100,000 physicians claiming anti-trust violations, among others. 10 December 2018: ABIM issues a statement concerning the suit on its blog promising that "the organization will vigorously defend itself, recognizing that doing so will consume resources far better dedicated to continuous improvement of its programs." 21 December 2018: The far-reaching implications of the antitrust suit reach across the pond. It's been quite a ride. Here's to a productive New Year in 2019! Primum non nocere - latin for "first, to do no harm" - is a philosophy working physicians aspire to throughout their careers when caring for patients. It defines a bioethical baseline for physicians and should be their guiding light in clinical decision making throughout their careers. Unfortunately, as is too often the case when politics and power enter the picture, it is easy for physicians to fall prey to avarice and greed, placing their financial and political interests before their patients and physician colleagues. Such is the case, in my opinion, with the bureaucratic ranks within the academic House of Medicine. Today, it is "pay to play" for hundreds of thousands of US physicians thanks to the American Board of Medical Specialties (ABMS)/American Board of Internal Medicine(ABIM)'s Maintenance of Certification (MOC) program. As I mentioned in an earlier blog post, I received a notice in late November of this year by US mail that I had to earn 100 Maintenance of Certification (MOC) points, or I could see a "change in my certification status." The ABIM webpage displays that notice prominently as well. Recall that I certified in both Cardiac Electrophysiology and Cardiology with the 2013 testing cycle. At that time, according to the ABIM's website and this archived webpage from January 18th, 2013, MOC required that I perform 100 MOC points every 10 years. When I purchased MOC and registered to take my recertification test in October 2013, this is what I thought I was purchasing. Now I find the ABIM has changed the rules. Now we must perform 100 MOC points every 5 years. Needless to say, I had only 10 MOC points when I received that notice from the ABIM after the Thanksgiving holiday. I had vowed not the earn another point until it might be needed 10 years from the data I enrolled for my MOC exam and have been working to end MOC through conventional channels since that time. I have talks at the AMA House of Delegates, Ohio Health committee, and help with the Texas anti-MOC legislation as proof of that effort. One guy doesn't stand a chance, I learned. Still, I became worried about the implications of now needing another 100 MOC points and the time, focus, and commitment required so I could keep seeing patients. I searched for ways I could fulfill my requirements without paying the ABIM another dime. This is where things got interesting. It seems I pre-paid for "30 MOC points" - one for a 2017-2019 Hospitalist Update, a 2017-2019 Internal Medicine Update, and a "Care for the Underserved" module that offered 10 MOC points. (The other offerings that might have been there before had "expired.") These thirty points wouldn't be enough to get me where I needed to be by 21/31/2018. Furthermore, learning about these non-applicable topics to my specialty seemed to be a waste of time. Still, I needed points, so I did what I could and even performed the Hospitalist update. I was surprised to find that the ABIM's own Robert Wachter, MD, "Mr. Hospitalist" himself, helped author this module. Because it was outside my wheelhouse, that module took way too long to successfully complete, but I finally did it to earn my "points." I was getting concerned. I checked the Heart Rhythm Society's webpage hoping they would have a module closer to my specialty that I could complete quickly and was surprised to find that they could only offer me 6.75 MOC points if I purchased a $650 Medical Knowledge update in Electrophysiology - a cost of $96.30 per MOC point! That was an astronomical price per MOC point and one that wouldn't get me anywhere near my goal of 100 total points. The ABIM site suggested I look at the various offerings provided by the ACCME at http://www.cmefinder.org - a horribly rudimentary website that had poor filtering capabilities for the offerings I might need. They sent me to this hospital system and that hospital system with ways to game the system, but nothing would work for me or each offering gave me 0.5 to 1 MOC point each. Everyone, it seemed, were more than happy to offer a point here or a point there, but every point required a post-MOC survey of how I liked it, it the exercise was free from commercial bias, etc. - all very time-consuming - so I kept looking. I turned to the American College of Cardiology's website since I am a Fellow of the American College of Cardiology and looked at their MOC offerings. I still needed a LOT of points if I was to make 100 by 12/31/2018. That's when it struck me: this was the plan! Whether you're an ACC member or not, you've got to pay the Man. There, on the ACC's MOC webpage was this offering: ACC Self Assessment Program 9 (ACCSAP9) for $1600 in return for 155 potential MOC points good through mid-2019, a bargain-basement price of $10.32 per MOC point! Left with few options this late in the do-or-die MOC extortion game to keep my hospital privileges and insurance payments coming, I purchased ACCSAP-9. Before I could get started, I had to agree to a "Credit Agreement." In that agreement I had to agree to "read all text, watch all presentations and answer all questions within the topic for which you claim credit. You must obtain 70% or better on the questions, but you may answer the questions as many times as necessary to achieve that score." Then there was the indemnify and hold harmless "Disclaimer" clause of the Credit Agreement: "The American College of Cardiology is not responsible for the results obtained from the use of the information contained in this publication... The American College of Cardiology does not warrant the information contained herein is in every way accurate or complete, and disclaim all responsibility." Ahem, isn't this WHY we're being forced into this expensive exercise? If I can't rely on them to assure patient and "the public's" safety, what good are these "Knowledge Assessments" for patients? Having no choice but to "agree" to their terms, lest I lose my hospital privileges and insurance payments to my hospital on 1 Jan 2019, I reluctantly clicked "I agree" and started the arrhythmia section of the testing the week before Christmas. My wife and kids were not pleased. "Dad, be here now. It's Christmas! Here you are, 35 years of experience, doing these mindless exercises and getting all stressed out. Haven't you done this long enough?" "Honey, it's always me doing everything for Christmas while you get all stressed out and have to sit at that damn computer, doing quizzes. Will it ever end? How many years has it been?" I realize that they are right. Years of being Mr. Good Guy while they lost out on their father. Experience means nothing to the ABMS. Money is everything with MOC. It is clear to me now that the "lifelong" educational system for physicians is horribly broken - a once reasonable voluntary system of continuing medical education required for state licensure, has morphed to an do-or-die extortion scheme for doctors' money. It's not about the patients or the doctor. These organizations indemnify themselves of this responsibility. It's just about the money. And for hospitals and insurers, it's about control of the doctors to keep their profits high. The ACC - our cardiovascular specialty society that looks more and more like the AMA, has found a way to get rich - very rich - using the threat of my loss of privileges to fund their organization via the ABIM's MOC program. No wonder they collaborate. The American College of Physicians (ACP) has their Medical Knowledge Self-Assessment Program (MKSAP) likely does the same thing. So does the American Board of Pediatrics. Whether the ABMS member board is a "continuous certification" or MOC participant, the ABMS mothership keeps the money flowing to all of these entities who claim to educate using computer products while hiding behind "Disclaimers" that relinquish their responsibility. Buying a product in 2013 thinking one thing, only to find it's another, is fraud as far as I'm concerned. Doctors like me don't like being swindled and forced to play games that have no meaning so they can keep providing patient care. There simply are not enough hours in the day for any of us to put up with these shenanigans required by the members of the Accreditation Council for Graduate Medical Education (like the ABMS) for their financial benefit. They are not only hurting doctors, but hurting their families at Christmas time, too. The ACGME members and ABMS Vision Commission should each carefully read how the ABMS MOC program has harmed doctors in this latest serious anti-trust Complaint filed in federal court against the American Board of Internal Medicine. The "ABMS Vision Commission's" Draft Report fails to disclose these potential harms caused to physicians by MOC and its numerous conflicts of interest. Do they really think their assets will indemnify them of their responsibility to the well-being of working US physicians, and in turn, their patients? On Thursday 6 December 2018 in the Federal District Court of Eastern Pennsylvania, a class action lawsuit on behalf of over 100,000 internal medicine physicians was filed against the American Board of Internal Medicine (ABIM) by four internists. The plaintiffs brought the action pursuant to the Clayton Antitrust Act, 15 U.S.C. §§ 15 and 26 to recover treble damages, injunctive relief, costs of the suit, and reasonable attorney’s fees arising from violations of Sections 1 and 2 of the Sherman Act (28 U.S.C. §§ 1 and 2). The suit alleges that there is illegal tying of the ABIM’s initial board certification product to its maintenance of certification® (MOC®) product in violation of Section 1 of the Sherman Act and illegal monopolization and monopoly maintenance in violation of Section 2 of the Sherman Act. The suit claims that after the ABIM's attempts to sell a voluntary "Continuous Professional Development" accolade program failed to recruit enough physician interest, the ABIM created a wholly new market product for itself, time-limited board certification (later branded as "Maintenance of Certification®" or MOC®), forcing physicians to purchase this product or lose their specialty certification. It also alleges ABIM induced hospitals and related entities, insurance companies, medical corporations, and other employers to require internists to be ABIM-certified to obtain hospital consulting and admitting privileges, reimbursement by insurance companies, employment by medical corporations, malpractice coverage, and other requirements of the practice of medicine. As an indication of ABIM's illegal tying and monopoly maintenance, the suit claims, is that the ABIM is able to charge inflated monopoly prices for MOC®, increasing the fees it generates from MOC® 276% since 2000. Each of the plaintiffs have claimed substantial harm caused by MOC®. A link to the full Complaint can be found here. Update: The original class action anti-trust Complaint filed 6 Dec was amended 23 January 2019 to include claims under the RICO Act and state law unjust enrichment claims. Doctors' Right to Privacy: Is MOC Collapsing Under Its Own Weight? On Saturday, 1 December 2018, the American Board of Internal Medicine (ABIM) suffered a meltdown of its highly touted "Knowledge Check-in" ("KCI") alternative to its mandated Maintenance of Certification® (MOC) program. At 09:45 AM, Saturday, December 1, 2018, during the ABIM Internal Medicine Knowledge Check-In (KCI) administration, Pearson VUE – ABIM’s exam delivery provider – experienced network instability issues that affected hundreds of physicians scheduled to take the Internal Medicine KCI exam. As a result of these issues, over a period of approximately two hours, physicians were unable to start the KCI, and those who were in the process of testing were unable to proceed. "KCI," a program that requires continuous payments to ABIM of $155 per year per US physician, was heavily promoted by ABIM as a "kinder, gentler MOC" that physicians could perform in the comfort of their own home, provided of course, that the physician's computer met ABIM's exacting standards. If not, the physician was required to pay an additional $130 to take their MOC examination at a PearsonVue testing center. Sadly on Saturday, hundreds, if not thousands, of US physicians (we really don't know) - all of whom had already funded millions upon millions of dollars for expensive executive salaries, benefits, and contractor expenses to the ABIM for years - lost another of their few precious free weekends staring at computer screens like guinea pigs for academic medicine's biggest income redistribution Ponzi scheme, MOC®. Not surprisingly, after a lackluster apology, the ABIM tried to deflect blame to someone else: Pearson VUE. At approximately 9:45 AM (EST), on December 1, 2018, ABIM began receiving reports from Pearson VUE and individual test takers that they were unable to begin the exam or were unable to continue it if they had already started. Might the problem have gone beyond Pearson VUE since individuals at home were similarly affected? Recall that security of ABIM's examination is of utmost importance to them. They've even had a "Director of Test Security" and even sent their own director of test content to spy on physicians attending a board review course without their knowledge and later sanctioned or suspended over 130 physicians' board certification certificates accusing them of "cheating" in 2009. At that time, the same Director of Test Security for ABIM also worked for a litle known test security firm, Caveon Test Security. It was David Foster, PhD, CEO and President of Caveon Test Security, who was also a Chief Scientist at Kryterian Global Testing Services that touted the security and reliability of their patented keyboard and eyeball monitoring services to the American Board of Pediatrics Foundation on 15 May 2015. It was Kyterion's home testing platform that the ABIM's entire KCI initiative was based. ABIM diplomates like myself want to know what role the link to Kryterian Global Testing Services had in the events of December 1, 2018 KCI meltdown. ABIM is obligated to come clean on this issue, since it appears more than just testing was occuring that Saturday in December. If the link to Kryterion's keyboard and eyeball tracking technology were involved, physicians' privacy rights may have been violated as well in the name of test security during this latest MOC® debacle. 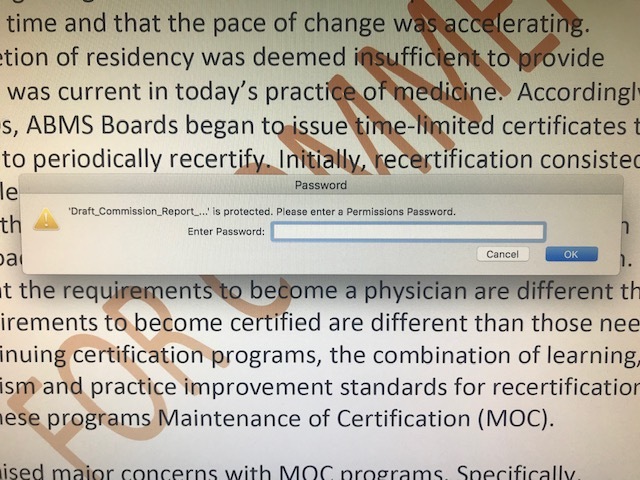 The American Board of Internal Medicine's (ABIM) ongoing seemingly endless changes to their Maintenance of Certification® (MOC®) product is affecting physicians who re-certified a short five years ago - like myself. From 1936 to 1990, ABIM Board certification was a lifetime credential. From 1990 to 2005, ABIM ended lifetime certification, and began issuing only time-limited certification to physicians for those certified after January 1, 1990, requiring re-testing (and renewed payments to them valued at more than a thousand dollars) every 10 years. In 2006, "Maintenance of Certification," a product rebranded from "Continuous Professional Development" (note the similarities of these two linked webpages) was implemented. MOC was later trademarked by the American Board of Medical Specialties who stipulated programatic alignment from ALL physician subspecialty boards and required them to perform additional practice performance tasks and earn 100 "MOC points" AND re-take their board certification test every 10 years. Additional fees were often required to earn points from "MOC-eligible" courses. In 2013, the ABIM imposed more burdensome changes to MOC, not only having to re-take their examination every 10 years, but a "MOC activity" had to be completed every 2 years with patient safety, patient "voice", and survey modules or "Practice Improvement Modules" performed every 5 years and they also had to accumulate 100 MOC points every 5 years. Now the ABIM requires internists to pay not only an annual program fee to participate in MOC, but an "Assessment Fee" for MOC examinations. Internists can sign up for Knowledge Check-in examination every two years, or still take the 10 year examination. Through self-serving rule changes, the ABIM has become a tax-exempt for-profit money machine that has placed physician bank accounts on high continuous suction. They coerce physicians by threatening them with the loss of their credentials or ability to receive insurance company payments to keep the money flowing. We know why: thanks to their own hubris and avarice, they are failing financially. They have lost the trust of US physicians. And are a partisan organization beholden to the Medical Industrial Complex, not patients. Given then above information, I believe the ABIM's tax-exempt status should be revoked. Their fees have skyrocketed from $795 to $2200 over 18 years (2000 to 2018) - or 276% - while providing the same product, "certification" of working internists since 1936, nothing more.